Nothing says ‘wedding’ like white–or does it? As it turns out, wedding dresses haven’t always been white. In fact the tradition is a relatively new one in terms of wedding dress history. The La Grange Historical Society in in Illinois showcases 80 vintage dresses, and many are not white. So how (and when) did colored wedding dresses become a more offbeat thing, and white the favored tradition? When did white wedding dresses first become popular? It’s difficult to trace the specific origin, but most historians attribute the white wedding dresses trend back to Queen Victoria of England. During the Victorian age and under her own dress example, white came to symbolize purity, virginity, and a connection with the Church. Over the decades, the beauty of a white dress superseded its original symbolism, and the white wedding dress trend came to be worn for both religious and secular weddings. What if I don’t love white wedding dresses? The irony is, even ‘white’ wedding dresses aren’t always stark white. 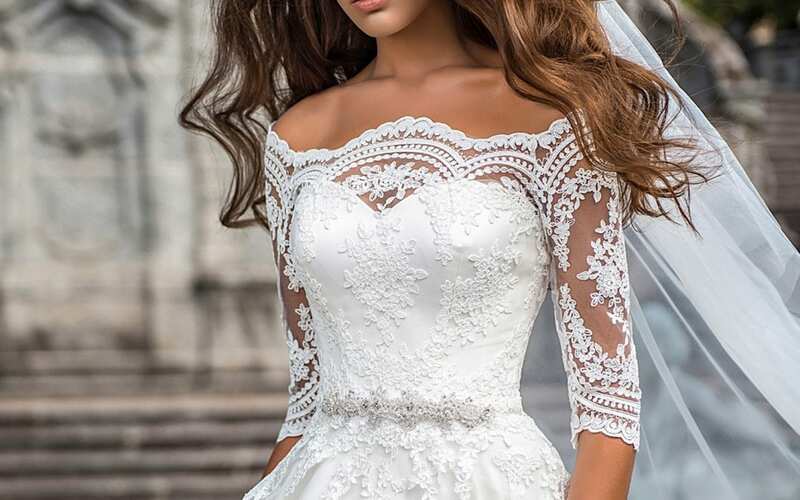 The most popular wedding dresses are sold in a variety of white shades, from more pure whites to ivory and natural white, to white with touches of gold, like champagne, alabaster, and mocha (and even light gold). Outside of these, soft blush pinks are becoming increasingly popular, as are dresses with colored details like floral prints or colored sashes. You can also find full color dresses, though these are a it rarer and may need to be custom-ordered. Will white wedding dresses always be popular? If you know anything about fashion, it changes constantly, so it’s nearly impossible to predict whether we’ll one day see a new color that precedence, though Queen Victoria’s dress seems to have staying power. The link to symbolic meaning, even if not used in the same way, coupled with the prestige and history, is one reason white wedding dresses have been popular for so long. But also expect more brides to choose less conventional options. Off white used to be a more controversial choice, and now ivory is one of the most popular hues. And with more brides going less traditional routes, colored gowns are likely only to increase in their popularity.